With thanks to the Consumer Action Group (CAG) for the information. Members of the public could be charged up to £100 to submit requests for information to councils, police forces or the Government under a right-to-know crackdown. A commission set up by ministers to examine changes to Britain’s Freedom of Information regulations has confirmed that it was looking at copying countries such as Germany, New Zealand and Ireland which charge individuals to make requests. The review will also examine whether cabinet ministers should be given greater powers to veto information requests and if some exempted categories should be extended. While the commission has yet to suggest a fee structure, Germany usually charges €50 (£37) to €100 per request, although this can be as high as €500. New Zealand levies $38 (£16) for each 30 minutes spent collating information after the first hour. Although the commission made a public call for evidence on the topic, campaigners fear its result will be a foregone conclusion. At least one of its five members, Jack Straw, is a critic of the Freedom of Information Act; the chair is a former senior Whitehall official, and there is no representative of any group known to be in favour of keeping the legislation as it stands. It’s worth taking part and only takes a few minutes to complete. I know some people will argue that it’s probably a foregone conclusion, but, if you don’t make your views known then they won’t be taken into account. Here is a link to the consultation document, which gives some background information. If it helps, here are the questions and answers from my completed questionnaire, just to give you some idea. Don’t use it as a template, try and use your own words if possible and don’t be afraid to leave sections blank if you have no particular view on the question asked. Questions: What protection should there be for information relating to the internal deliberations of public bodies? For how long after a decision does such information remain sensitive? Should different protections apply to different kinds of information that are currently protected by sections 35 and 36? What protection should there be for information relating to the internal deliberations of public bodies? For how long after a decision does such information remain sensitive? Should different protections apply to different kinds of information that are currently protected by sections 35 and 36? : As I understand it, Sections 35 and 36 already provide sufficient protection with regards to; the formulation or development of government policies Ministerial communications, the provision of advice by any of the Law Officers or any request for the provision of such advice, or the operation of any Ministerial private office. I feel that the provisions in their current form provide adequate protection; plus the public organisation have the added protection of a ministerial veto, which although a rare occurrence is still available. Once the information ceases to be a draft, then it would, in my opinion, subsequently cease to be sensitive. What protection should there be for information which relates to the process of collective Cabinet discussion and agreement? Is this information entitled to the same or greater protection than that afforded to other internal deliberative information? For how long should such material be protected? What protection should there be for information which relates to the process of collective Cabinet discussion and agreement? Is this information entitled to the same or greater protection than that afforded to other internal deliberative information? For how long should such material be protected? : I believe that information which is relevant to the process of collective cabinet discussion and agreement should be subject to the same provisions currently afforded it by S35 and S36 FOIA 2000. What protection should there be for information which involves candid assessment of risks? For how long does such information remain sensitive? What protection should there be for information which involves candid assessment of risks? For how long does such information remain sensitive? : Again S35 and 36 are sufficient, to my mind in their current format. Should the executive have a veto (subject to judicial review) over the release of information? If so, how should this operate and what safeguards are required? If not, what implications does this have for the rest of the Act, and how could government protect sensitive information from disclosure instead? Should the executive have a veto (subject to judicial review) over the release of information? If so, how should this operate and what safeguards are required? If not, what implications does this have for the rest of the Act, and how could government protect sensitive information from disclosure instead? : A veto already exists in the form of a ministerial veto, which as I understand is subject to stringent legislation in its own right; I would therefore say that there is no need to extend a veto requiring possible judicial review which in and of itself is a costly and time consuming process for the person or organisation who makes such an application. What is the appropriate enforcement and appeal system for freedom of information requests? 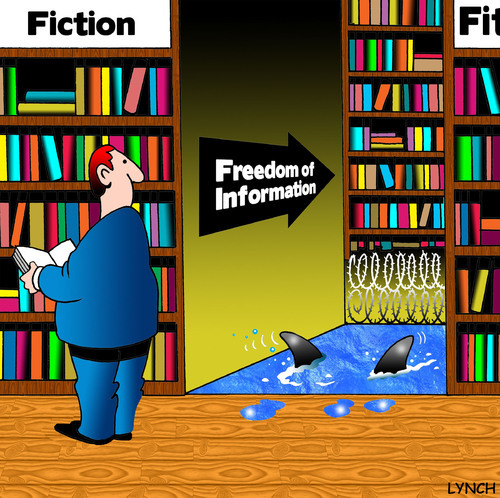 What is the appropriate enforcement and appeal system for freedom of information requests? : As it stands, the requester can ask the organisation to undertake an independent review if their initial request is refused. If the independent review upholds the organisations refusal, the requester can then make representations to the ICO. If the ICO continue to refuse the request, the requester has the right of appeal to the General Regulatory tribunal. This to me seems to be a robust enough process in it’s current form. The ICO does have the power to currently enforce its decisions in both monetary and documentary form. Is the burden imposed on public authorities under the Act justified by the public interest in the public’s right to know? Or are controls needed to reduce the burden of FoI on public authorities? If controls are justified, should these be targeted at the kinds of requests which impose a disproportionate burden on public authorities? Which kinds of requests do impose a disproportionate burden? Is the burden imposed on public authorities under the Act justified by the public interest in the public’s right to know? Or are controls needed to reduce the burden of FoI on public authorities? If controls are justified, should these be targeted at the kinds of requests which impose a disproportionate burden on public authorities? Which kinds of requests do impose a disproportionate burden? : Currently, the regulations state that if it takes the public authority more than 3 days or £600 to obtain the information, the request may be refused. That to me seems reasonable enough. The public interest is and should remain, a strong justification for providing the information. Many public authorities decisions are made using public money. It is only right and proper that the public know that their money is being used effectively. I have real and deep concerns about the public being charged a possible £100 to make an initial request. That is a large sum of money for information that might not be available or will be exempt. Will the requester be entitled to a refund? Won’t the whole process of payment/refunds bring about another layer of bureaucracy for public organisations, when there is already a squeeze on staff levels and resources,plus the subsequent delays this process will cause which will not fit in with the current deadlines afforded by the Act. It should be noted that,(although I appreciate many do not) the public organisation can charge a £10 administration fee for FOI requests if they wish. This entry was posted in Freedom of Information and tagged access to justice, consultation, Consumer Action Group, Freedom of Information, taxpayers, veto. Bookmark the permalink.